World fusion seems to be one of the current growth areas in creative contemporary music. Influences from cultures other than American or European sources are even finding their way into some commercial pop records. But off in the part of the music world we inhabit on this radio program, the mixing of cultures and traditions is something a significant number of creative musicians are plunging into with great enthusiasm. Of course, while sometimes the mixing of previously disparate sounds can produce brilliant results, at others it can come off as contrived or downright pretentious. The dance music scene seems to have produced some of the former, while the New Age scene especially seems to have attracted a few lesser artists who try to incorporate other cultures into their music without a good understanding, and then try to sound serious in their endeavors, with the result being stilted or even pompous. This week's album is another wild stylistic melange of World Music, approached from a direction which is itself a fusion of styles. 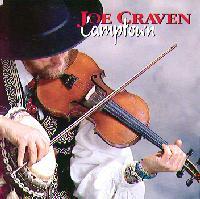 It's the new album by multi-instrumentalist Joe Craven, entitled Camptown. Joe Craven's musical specialty is what has come to be called New Acoustic music. It started when bluegrass musicians experimented with playing jazz and other non-traditional tunes on their string instruments. The father of New Acoustic Music is generally acknowledged to be mandolinist David Grisman, and Georgia-native Craven has been part of Grisman's group for seven years now. A lone-time San Francisco-area resident, Craven was a member of a fine, but short-lived trio called Way Out West, and also has been part of Davol Anger's group Psychograss. He has played as a studio musician on over 80 albums, including records by Alison Krauss, Bonnie Raitt and the Turtle Island String Quartet. Craven plays all manner of string instruments, including most frequently and mandolin and fiddle, along with percussion. Along the way he has attracted a lot of fans especially among his fellow musicians. Now Craven is out with his first solo album Camptown, the premise of which is to play traditional folk tunes, including Irish and American classics you hear at every folk festival, and serve them up in unexpected styles from Latin and Caribbean to Middle Eastern to Japanese. The result has the potential to be a disaster -- I am reminded of the days of the late 50s and early 60s when what is now being called "space age bachelor pad music" was being made, consisting of hideous instrumental versions of pop and standard songs done in so-called exotic styles with a bunch of randomly added percussion, and musicians who didn't have a clue about the styles they were playing. Though Joe Craven may not have mastered all the intricacies of say classical Indian or traditional Japanese music, the thing that sets Camptown apart from most cross-cultural fusion is its spirit of good fun. Despite the mostly acoustic instrumentation and generally light percussion, this a very danceable album, and the tracks are almost all upbeat and sound -- well -- happy. The arrangements favor cleverness over ambition, and when they don't work particularly well, with does happen on the couple of occasions on the CD, it's still fun to listen to. Craven proves his multi-instrumental mettle on this CD, overdubbing several parts on each piece, and literally playing the contents of the kitchen sink in addition to his fiddles, mandolins, ukulele and inventory of percussion implements. He is joined by different guests on every track, including most frequently bassists Todd Phillips and Derek Jones, and keyboard man Peter Elman. But the main focus is on Craven, who does some very tasteful playing, and always sounds as if he is having a good time. For the past decade, Joe Craven's fiddles, mandolins and percussion have been adding to the sound of New Acoustic Music. Now he is out with his first solo album that's a fun romp through stylistic mixtures, or perhaps, cultural collisions. While understandably this kind of experimentation is not always one hundred percent successful, it works remarkably well the great majority of the time. Craven's outstanding level of musicianship plays a big role, but also so does his attitude -- he approaches the mixture of styles as something fun to do, to make music you can dance to, rather than being intended as some kind of serious high art. At the same time, Craven also manages to walk the line deftly between interesting, creative music and novelty material. From a sonic standpoint, the album is also worthy of praise. Despite all the multitracking, the production doesn't sound mechanical, and the mix is clean, free of needless studio effects, and relatively unafflicted by compression. Joe Craven on his new album Camptown, has created a stylistic conglomeration that is distinctive, creative and fun.